spent the first hour plus of the year with the clique as usual, writing and sharing our resolutions. great to have baby “by my side” too although just virtually. spent the rest of the day at the annual thanksgiving in the morning and then to work. 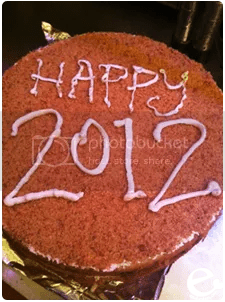 nothing really specially but we baked a cake to celebrate 2012! hope the year will mark a great start for everyone and all my fellow dragon babies, it’s finally going to be our year, again! heh.